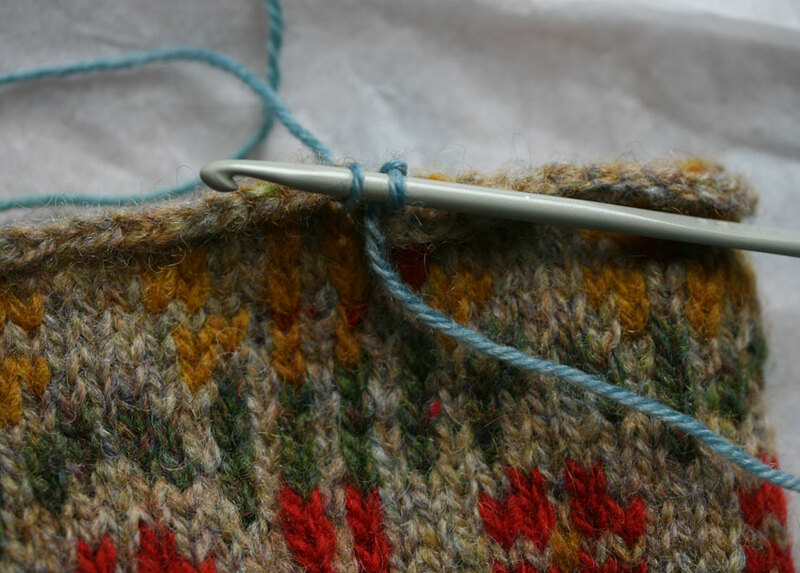 In this post I’m going to show you my preferred method for reinforcing a steek before cutting. My favourite method is the crocheted steek. Other methods are available, and I’m definitely not saying that this one is the “best” or the most “valid” or anything — it is simply the method that I like, and that I happen to use. I like it most because it creates a neat and flexible edge that remains at the same tension as the knitted fabric. I also like this method because the crocheted chain seems to ‘grab’ and contain the cut edges of the steek, squirrelling them away in a very pleasing fashion. Done well, there should be no “raw” edges, no loose ends of fraying yarn. All very reassuring for the nervous, novice steeker – and hopefully you’ll see what I mean in a moment. 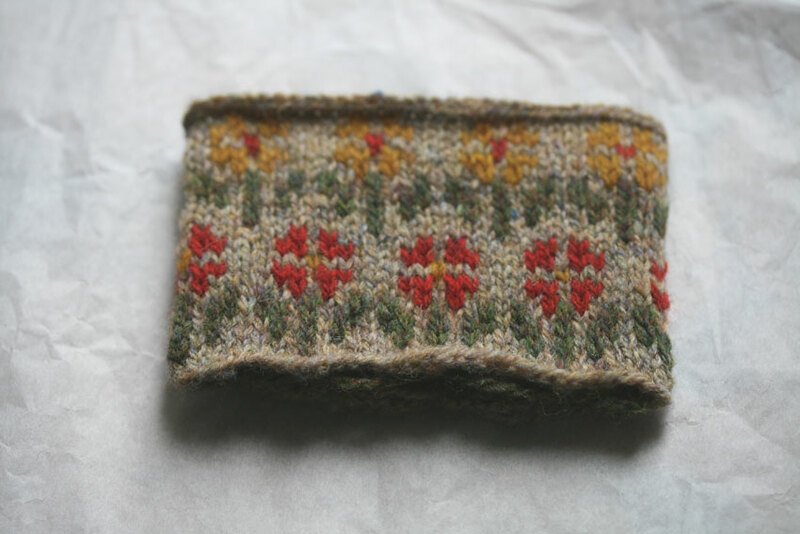 Here’s a close-up of the swatch, which uses the Peerie Flooers motif. (This motif also features on a new (steeked) cardigan pattern which will be released in a week or so). 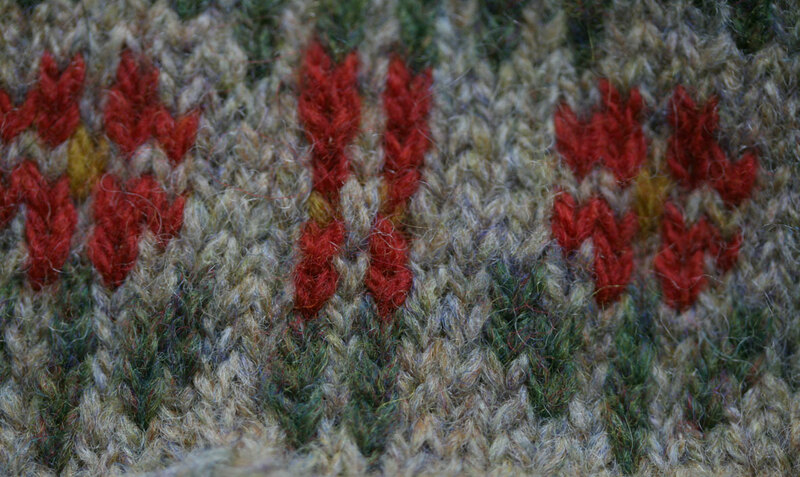 On the swatch above, you can see the steek stitches worked in stripes, sitting in the middle of the picture. A crocheted steek is always worked over an odd number of stitches — here, I’ve used five — and it is generally worked in a stripe or a checkerboard pattern. I like to work the five stitches in a striped sequence of background, contrast, background, contrast, background. That way you can see the central and two flanking stitches relatively easily. 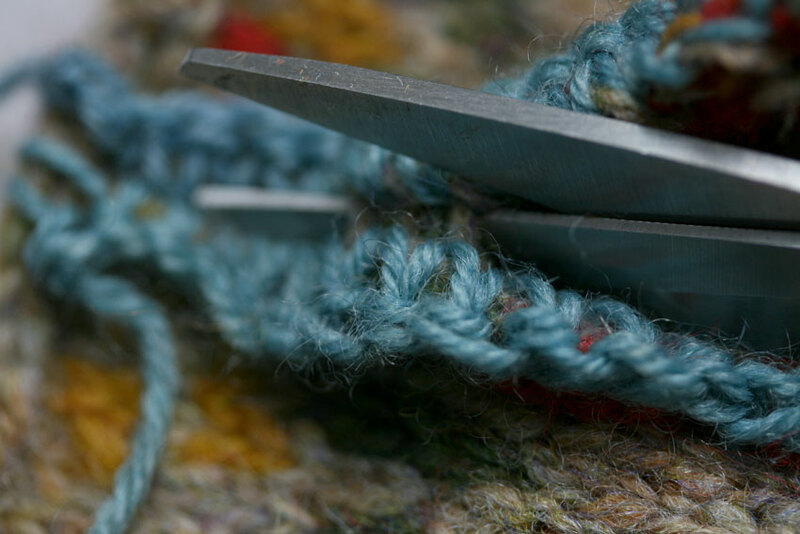 Your crocheted reinforcement will be worked over these three stitches. Before you begin, weave in all your loose yarn ends to the back of the work. Place all of your weave-ends a few stitches to the left or right of your steek – that is – don’t weave in the ends to the back of the steek itself. This is to ensure that all potentially-fraying bits of yarn are sitting well-away from where you are going to cut. 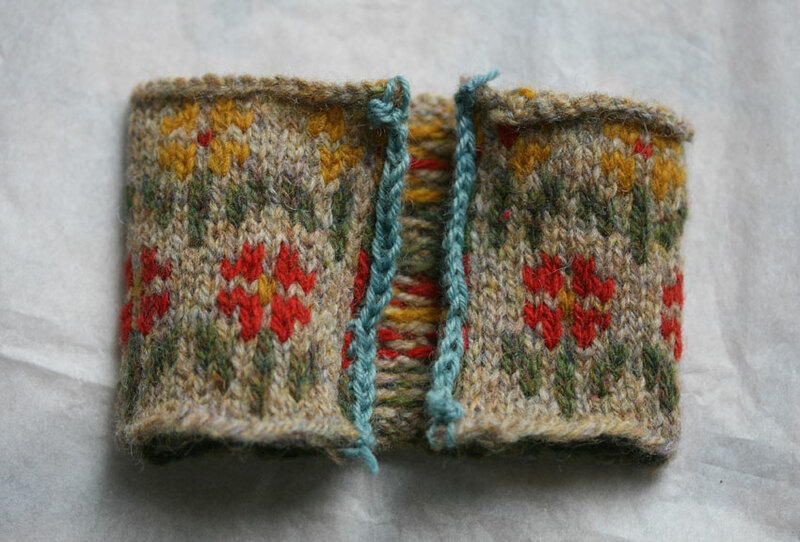 Here are the steek stitches again. If you click on the picture below, you’ll see that I’ve numbered them 1 to 5 — stitch 1 to the right, and stitch 5 to the left, following the right-to-left direction of the knitting. 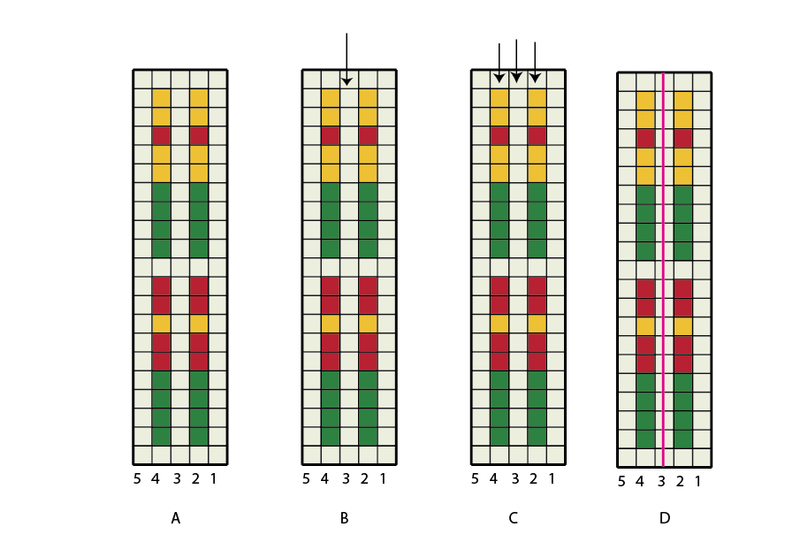 Here are charts that show the steek in the same colour pattern as the swatch, with the stitches numbered underneath, 1 through 5. Chart B has an arrow pointing to the centre stitch – stitch number 3. You are going to cut down the centre of this stitch later (as illustrated by the pink cutting line in chart D). Chart C has arrows pointing to stitches 2, 3, and 4. These three stitches are where you are going to work two chains of double (American single) crochet: the first chain will be worked between the front (left-hand) leg of stitch 2 and the back (right-hand) leg of stitch 3; and the second chain will be worked between the back (right-hand) leg of stitch 4 and the front (left-hand) leg of stitch 3. 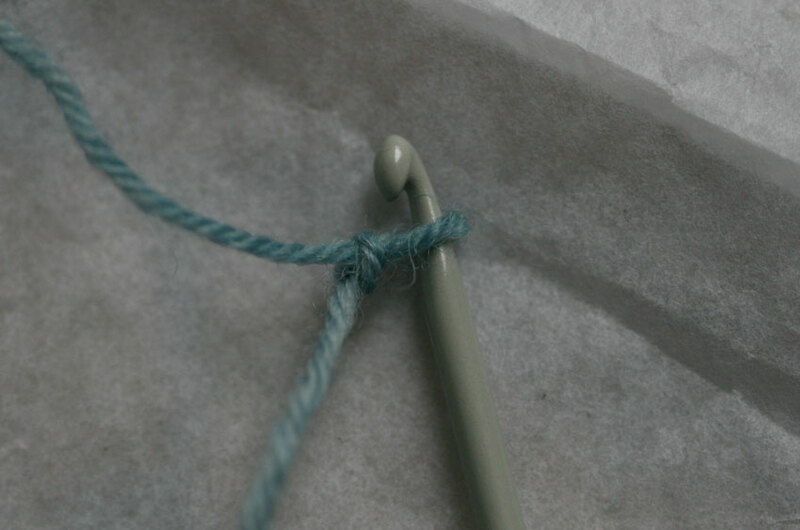 I like to use a crochet hook a size or two smaller than the needle I used for knitting (here I’m using a 3mm crochet hook on a 3.25mm swatch). I also like to use a yarn that won’t break when working the crocheted reinforcement. Here I’m using a good strong sock yarn. Now, make a slip-knot and place it on your hook. 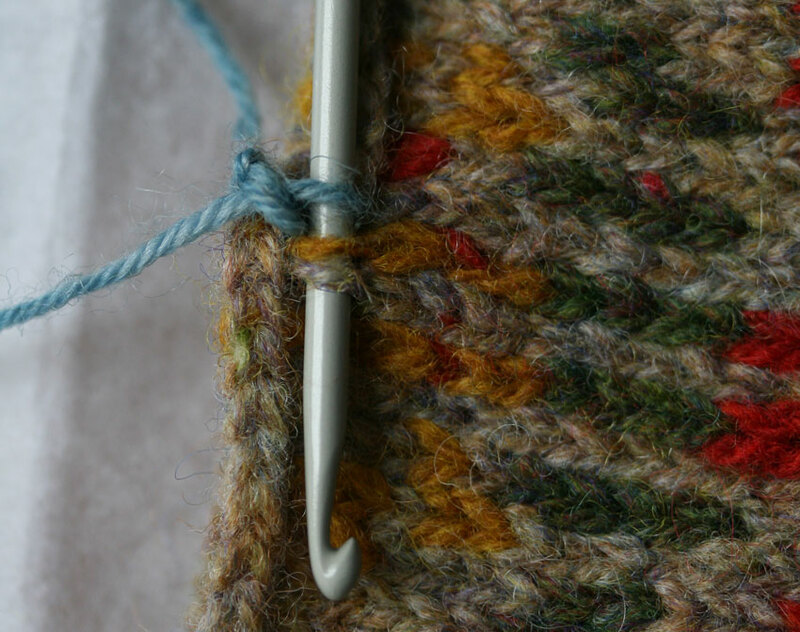 Take your hook and push it through the bound-off edge at the top of the swatch, right through the centre of stitch 2. Pull the yarn through again, this time bringing it through both loops, securing your sock yarn to the bound-off edge of the swatch (1 loop on hook). Now it is time to start reinforcing. C) Pull the working yarn through both loops one more time. (1 loop on hook). You have now made one reinforcement stitch. 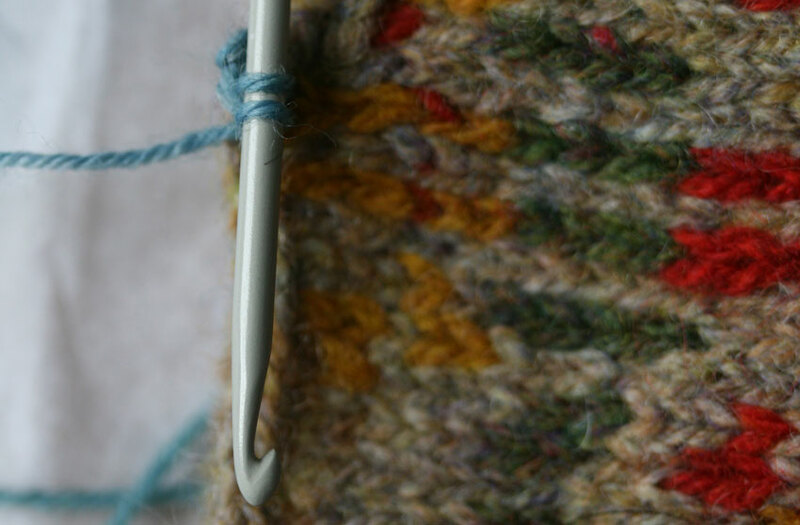 Continue in this manner, repeating steps A through C for every row of the swatch, pushing your hook under the front leg of stitch 2 and the back leg of stitch 3 each time. 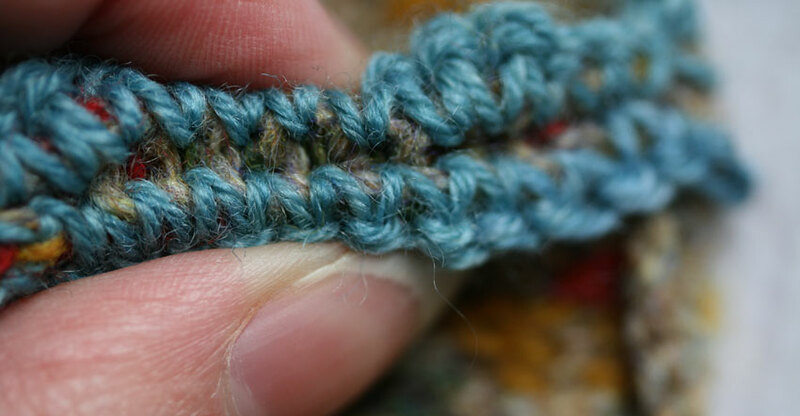 When you get to the bottom, secure your crochet chain to the cast-on edge of the swatch through the centre of stitch 2, and fasten off. If you look at your swatch from the side, this is what you see. The loops of the crocheted reinforcement run through stitch 3, pulling it away from the centre of the steek and connecting it to stitch 2. You can also see the other leg of stitch 3 sitting next to stitch 4. This is where you are now going to work your second reinforcement. Turn your swatch 180 degrees. 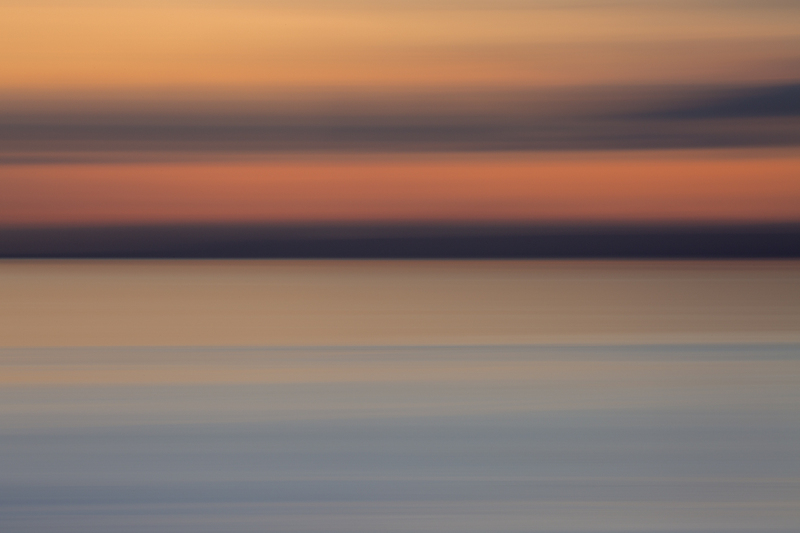 You are now going to work another chain in the opposite direction — from the cast-on edge to the bound-off one. 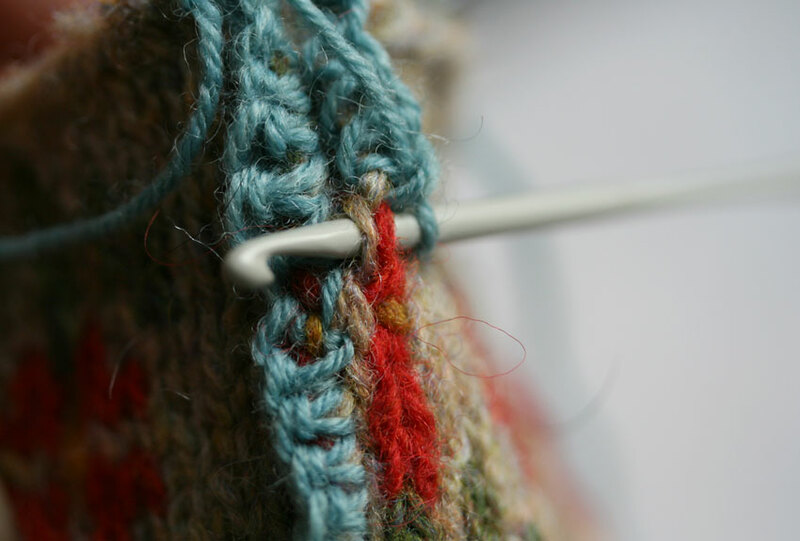 Push your hook through the centre of stitch 4, and fasten your sock yarn to the cast-on edge. Working through the back leg of stitch 4, and the front leg of stitch 3, repeat steps A through C above, for every row of the swatch. Here you see the second reinforcing chain beginning to emerge.
. . . and here are the two complete chains, lying parallel to one another. For ease of cutting and neatness of finish, I have two top tips. 1) Do not work your crocheted reinforcement more than once into the same pair of stitches. It is tempting to do this, as logic would seem to suggest that more reinforcing is better, and should make the cut edge stronger. But, the opposite is actually the case. If you work more than one crocheted stitch into the knitted ones you produce a curiously rippling crocheted chain that refuses to sit flat and flush against the knitted fabric. 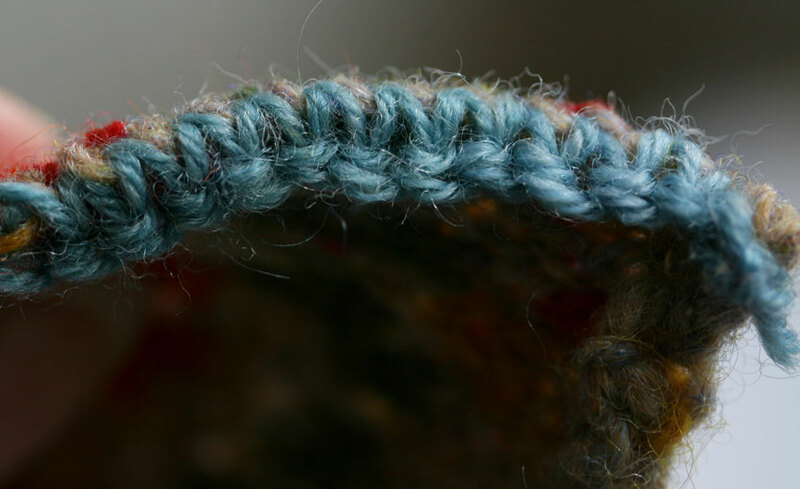 With more crocheted stitches, the cut edge becomes flappy and difficult to deal with, rather than remaining neat and easily contained. 2) Make sure you turn your work 180 degrees before working the second reinforcing chain. That is: the first chain should be worked from top to bottom, and the second from bottom to top. This ensures that the front and back legs of stitch 3 are both pulled away from the centre of the steek, making it much easier for you to see where to cut. . .
NOW THE FUN BEGINS: CUTTING TIME!!! If you carefully pull the two crocheted reinforcements away from each other (as in the photo above), you will see a ladder of knitted strands running up the centre of stitch 3. Take a small, sharp pair of scissors and cut each strand of this ladder, taking care not to cut the crocheted reinforcement. Here is the steek with a few strands cut. . .
. . . here are the two edges beginning to divide from one another. . .
. . . and here’s what it looks like from the reverse. Can you see any raw ends? No, nor can I. That is because the crocheted reinforcement has magically squirrelled them away. WHOOT! You just cut up your knitting! From the top, the reinforcement looks like a normal crochet chain. From underneath you can see how it grabs the edge of the steek. The edge is clean, secure, flexible and very stable. Right then, steekers, I think that’s all for today. In the final installment of this series, I’m going to show you how to further secure and contain the cut edges of your steek using a technique that I’ve called the “steek sandwich”. 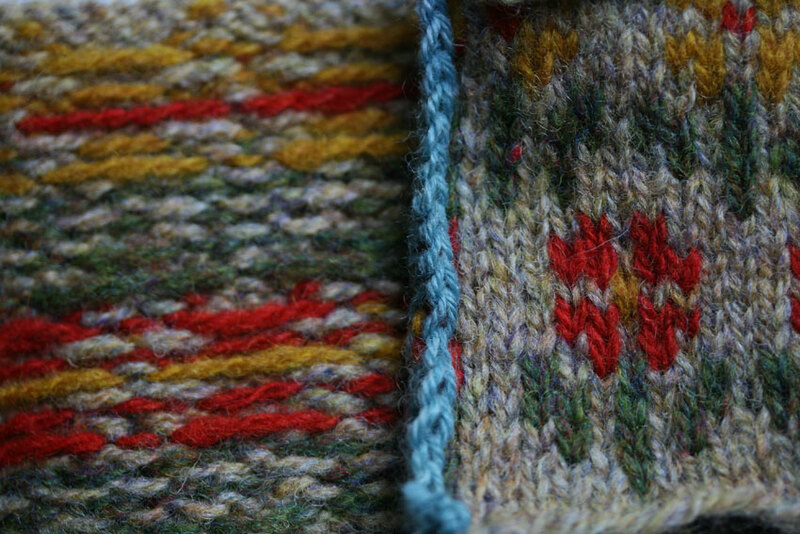 This technique features on my forthcoming cardigan pattern, where it is used to create neat facings at the front edge openings. Until tomorrow, then! I really appreciate your instructive and detailed tutorials, and am particularly relieved to have found this one as I gear up for my first ever steek experience I noticed in the Q&A of the next installment that you mention a light steam blocking … Shall I do that before the crochet reinforcement or afterward? Thank you, Kate – I am going to knit Ursula from your book Colours of Shetland. I have finished the tension swatch and cut the steek. It has worked perfectly! Thanks for your lovely clear instructions on steek-ing … I’ve just started Epistrophy. Because I have hand-dyed wool, I am swapping balls every 2 rows to even out any differences in skeins. I was doing the change over on the first stitch of each round, ie the one that will be cut. Also, when I swap colours, I knit the first stitch with one strand of each ball, then carry on with the new ball. This makes a slightly more lumpy stitch and I’m wondering if this is going to make it harder to get the steek to work neatly. Would it be better to have my yarn cross-over point somewhere else on the round? I just liked the idea of ‘losing’ the less-neat cross-over in the steek! 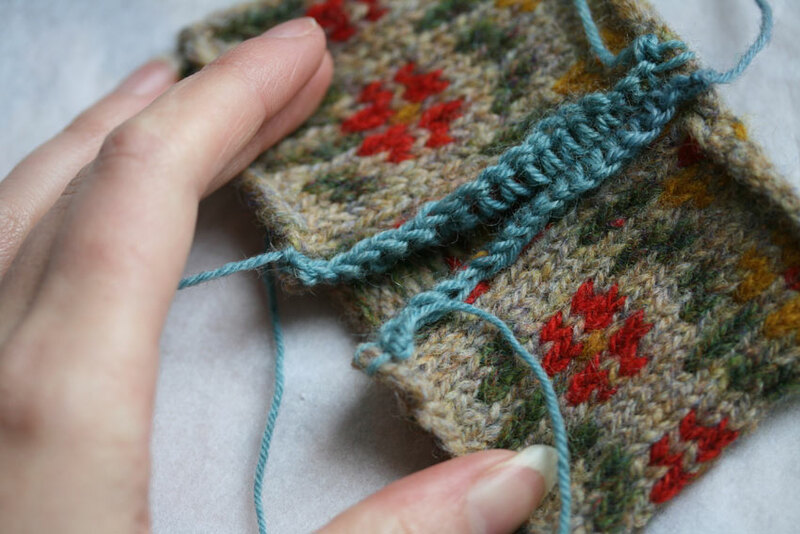 I think this will work absolutely fine – and if you shift your yarn change to the centre of the steek sts you can cut all the ends away and lose the cross over point completely. Kate, When you crochet your steek do you use the same yarn or something smoother than the body of the item? I have just finished Wee Bluebells and trying to crochet the 2 ply jumper yarn body with 2 ply jumper yarn has driven me to distraction. I finally gave up as the wool was too sticky and the knitting gauge just too tight. Such a sticky wool !! Is this an exercise in patience or am I doing this worng? Thank you soooooo much for these clear and calm instructions. I have spent 6 months knitting a blanket and I need to cut it now to open it out. V V V scared it all goes wrong, but with these instructions I now have hope that I’ll not end up with a lapful of spaghetti ! I have had several attempts to follow these instructions on the Foxglove cardigan steek, but because of the dark colour and the fine wool, I just cannot see the stitches I am meant to be crocheting through apart from on the yoke where the stitches are in a lighter colour. Even if I put on my best specs and sit under a strong direct light, I can’t manage to do it. Can anyone suggest an alternative method to bind off before cutting? Have you tried doing it with something white like a pillowcase underneath the knitting? The contrast may help. Rita – I had the same problem and solved it by using white yarn sewn straight down from the top on the stitch that would be cut. I then knew exactly where to crochet. I tried doing the same with pins to mark that stitch and it didn’t work. I am not a crocheter but managed just fine. Tomorrow I will cut the little ladders and start the steek sandwich. Hope this helps. I don’t know what I did wrong, but I decided not to be scared and followed these directions and cut the steek. Indeed, it fell apart the second I began picking up stitches. :( Knitters who have never steeked before are not wrong to be scared. 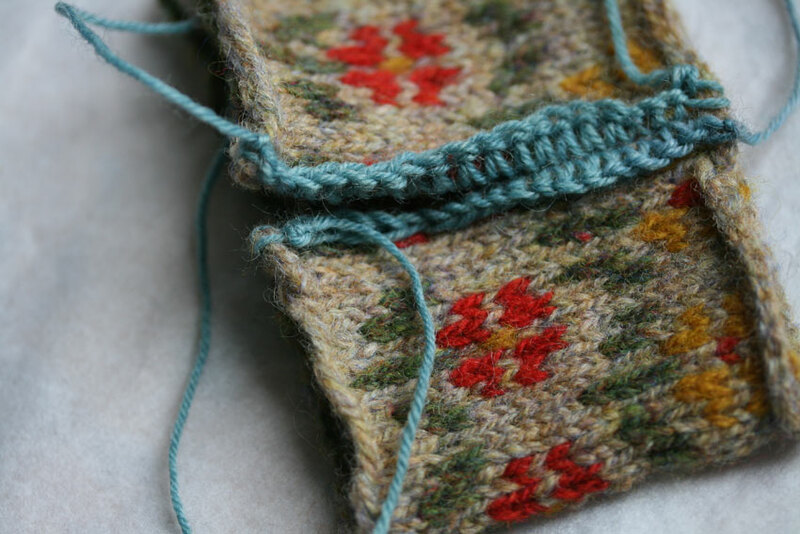 I wish I’d tried this on a swatch before but the tutorial was so clear that I was sure I knew what I was doing. Now I have a disintegrating baby blanket. Any suggestions on how to stabilize the edge and salvage my work would be welcome, if any of you reading happen to see this comment and have ideas. Try this video. https://youtu.be/2cn5tiy3XPk for a technique for securing the fabric after the steel is cut. Good Luck! I ended up machine stitching it and that’s my go-to way now for insurance, but the reason it fell apart turned out to be due to my method for picking up stitches. You really have to do that Kate’s way for this to work. The text is in German but you can find an English summary at the bottom of the post. Many thanks and greetings from Bavaria! I thought I left a comment last week, but apparently not. I see on your tutorial that you are doing a crochet steeking on multiple colored knitting (fair isle?). I have tried this technique on one colored knitting with great success, but never tried it on two-colored pieces. Will it hold? just checking. It’s quite scary to cut. Thanks for the steel tutorial. Most helpful. Could you imagine letting us download a pdf of you tutorials? I would like them on my iPad, which I used nowadays for knitting information and patterns. Thank you so much for the Tutorial. Knitting is a bit of a lost art. I would watch my grandmother knit and, I was inspired. I am left handed an self taught. Here I am now in my 55th year and a friend has asked me if I could take in the sides of her Irish Knit hooded sweater. I said sure I can. As, I was getting lots of static from my husband who said : I’m not letting you cut her sweater until you know what you’re doing. So, I went on the internet and typed in “how to cut a knitted sweater”. And, lo and behold I’ve been introduced to a new facet in knitting that I had never before heard of!!! Steeking!!! Well, now I have a question can a “Steek” be done over a pattern of seed stitch?? Before I cut, I’d like to know. I can’t find a piece to practice on! Dear Kate, I own a book ebtitled ‘The Ultimate Knitting Bible’ and nowhere does it contain anything relating to ‘steeking’. I was at my wits end until I discovered this post. Can I make a humble suggestion – why don’t you publish a book with all your knitting tips and ideas in, preferably with pictures because written instructions sometimes just don’t get through to me! Simply love your work, here I go with the Rams and Yowes. I am no longer afraid of steeking! Thank you, SO MUCH!! I JUST did this! I steeked a sweater I was too chicken to steek when I first made it. I had a shot of lemoncello before cutting, but, I did it. I wanted to close off the year with a bit of daring. I still feel dizzy, but, that might be the shot…..not the cutting! I found your recent Blaithin cardigan pattern on Ravelry and fell instantly in love. I was also smitten with your photos on your bike and the background scenery so I became equally interested in your background so I went to your blog. I started reading your most recent posts and read something about your stroke which horrified and baffled me so I had to go to the very beginning of your archives so I could get the full story. I have been reading your blog every chance I get for the past two weeks and I just want you to know how much I thoroughly enjoy it. I love, love, love your photographs of the beautiful Scottish countryside, I love your dog Bruce who looks very similar to our naughty dog, Scout and I love your designs. I love your informative historical ramblings on whatever catches your interest and of course your determined, creative, clever, funny spirit. Though you and I lead VERY different lives, MANY miles apart – I feel as though you are a dear friend who I have cried with, laughed with, knit with and whose company I truly enjoy. If you are ever in Chicago – you have a place to stay – as long as four kids, three cats, one dog and two turtles won’t drive you bonkers. Thank you for sharing your life, your creative energy and your wonderful spirit. I look forward to reading your future posts. Oh! And I forgot to add that your explanation on skeets was THRILLING and took away a lot of fear I had about trying it. Thank you so much for posting that – really well explained and photographed! Now, where did I leave my scissors??? Wowe! This is revolutionary for me :-). Frankly, I only steek in grabby yarn, so I’ve never bothered to do any sort of reinforcement at all, I just cut straight and pick up a couple stitches in. And I’ve never had any sort of trouble with fabric undoing itself. But I can see this would definitely be an improvement :-). Thanks! Hi Kate – A little late to comment but here I am. Yesterday I crocheted around my armhole steek and CUT it up the middle. It works. However, I now see that you are quite right about finishing off the ends away from the steek as the fabric is rather thick. I think it will be OK though and I have learnt a new technique. Previously when steeking I have just cut and rolled the edge back catching it down with a criss cross stitch but I think the crochet is going to be a much neater edge as you so rightly say. Your instructions are terrific and thank you for showing us all so clearly what to do. It is just commensense after all but steeking pushes against most knitters boundaries and freedom is just around the corner!! AHA! This is what I have always needed! True step by step with pictures. Fantastic detailed photos! I am crochet-phobic, so I really appreciate this. I have been knitting for a while (about 18 years) and I hate to venture outside of the “craft”. This reluctance applies to crochet, sewing on zippers, crochet provisional cast on, and attaching fabrics. Usually when I steek, I just use some nice woolly wool, some sharp scissors and try to pick up the cut stitches before anything bad happens. As a result I always have a bit of an edge one when steeking / about to steek. This crochet business seems to take the pressure off. That sounds and looks so easy. You have described it so clearly. I haven’t done a steek, due more to the fact that I was terrified of the stitches running away. But I can see clearly in your pics, that they don’t. I might have to try steeking a swatch this afternoon. I am curious about why you worked the ends in. I was told that in my first fair isle project with a steek (which I have yet to cut) to be sure to switch yarn colors at the steek specifically because, since the fabric will be cut here, I won’t need to weave ends in. This is a lovely tutorial and I very much appreciate you taking the time to make such clear photos! thank you! Me too, I am about to cut the steek on a cardigan with a multicoloured yolk and many ends at the steek. I thought I could just trim these ends off. Will this doom my project? p.s. steek knits up the ravel’d sleave of care. hott! i love a good solution to existential problems. Thank you for sharing! This was really interesting! What an awesome tutorial you’ve explained and shown what to do very clearly. I haven’t done a steek yet and had planned to learn by knitting my granddaughter a cardigan so the fact that you’re putting out a pattern with this technique has got me stoked. I love your designs but even more I love how I’m always learning something new when I knit them. Thanks for being such a wonderful teacher. This tutorial is so timely, Kate. I am just about to steek a large swatch (which will go to decorate a cloth messenger bag). I was thinking of soaking and blocking my swatch first, before doing the crochet edge and cutting it. What are the pros and cons of letting the yarn “bloom” *before* you cut it? Beautiful work! How wonderfully concise and easy to understand – this is an excellent method. You are such a great teacher and thanks so much for sharing this. I can’t wait to see the Cardi! Just brilliant! Still scared of steeks, but excitedly so now! So very clever! 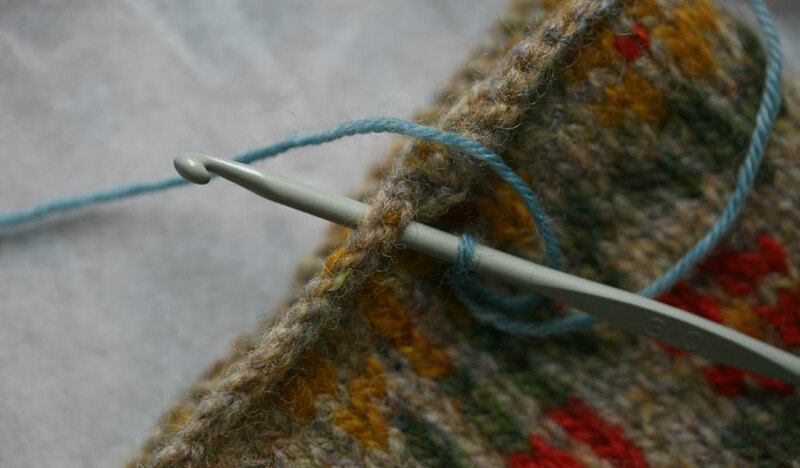 Steeking is my next thing to learn, and I will definitely try this. Thanks so much for putting this clear and helpful tutorial together. Thank you, Kate! I usually do not get to check your blog as much during the weekend…so much to do with my little girl….but seeing that you’re back must mean you are feeling better! Yay…. Plus, I must not be reading your pattern correctly…192 sts per side, after increases should be at 780 sts…so is it 3 stitches per corner? I re-read the pattern many times…first corner p/u 2 sts, second/third/forth corner p/u 1 st – that would mean I’m 7 sts short….pls help! Hi Kate – I have always done steeks with a much wider stitch base to work on – at least 7 to 9 stitches. I use whatever two yarn colors i have in my hand, in an alternating pattern, and when I am ready, say to do the sleeves, I just cut down the middle stitch, leaving either 4 or 5 stitches on either side. They curl nicely towards the inside, and I pick up the stitches around the edge and knit the sleeve (I usually do both at once). Then when the whole garment is done and I am ready for all the finishing, I go back and roll the steeks under towards the seam and neatly, with the yarn, do a cross stitch all the way around. 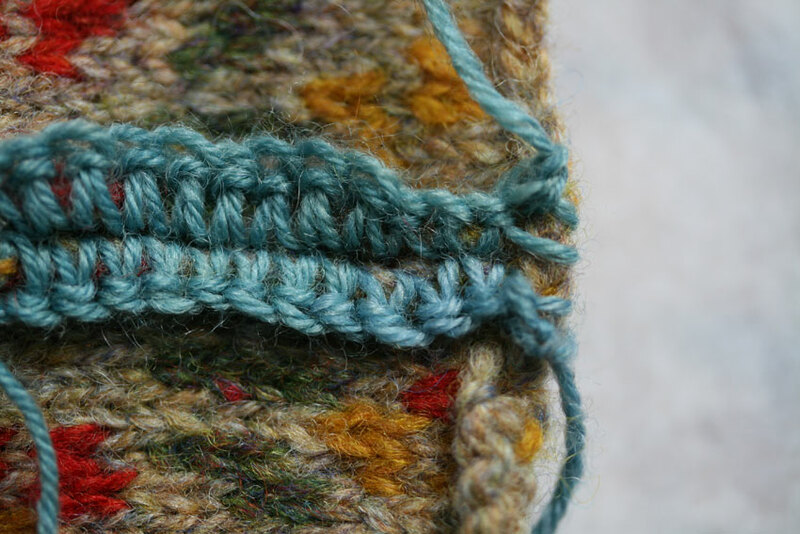 If the 5 stitch is too bulky, I will sometimes cut it down to 4, but 3 is usually too small. The finish is usually very neat, reinforced and gives a nice roll to the shoulder. I think I learned this method with the first Alice Starmore sweater I did, but I do love your method, and it is very good for people who seem to be afraid of steeks. This has never been my problem, and I don’t understand what the fear of steeks brings to so many knitters. It must be in the word, because I was very anxious to try them out and was very happy when I found a garment that had them that I liked and wanted to knit. I may have to find another garment now that has some steeks just to try out your method. I have lots of Jameison wool sitting around in my stash – some from before they cut down their color offering to what it is now – so it is going on 18 years old – all in good shape, but not much with more than one color. Good for a mega sampler. Your directions, photos and written directions as usual, are the best, and I am forwarding them to my knitting friends and saving them in my “needled” file for reference. Thank goodness for the internet! Kate davies you are a gem! I have gone from being a person who was terrified of steeking to one who is now impatient to start! THANK YOU!! This is a lovely neat way to seek. I have used a similar method, but with a wider steek, so there are a couple of stitches betweent he reinforcing and the cut edge. They lie flat and felt a little into the body of the fabric after a couple of washes. But they don’t lie as flat as I’d like, especially on the curve of the armscye. Thanks for this. Thanks Kate. Great instructions. 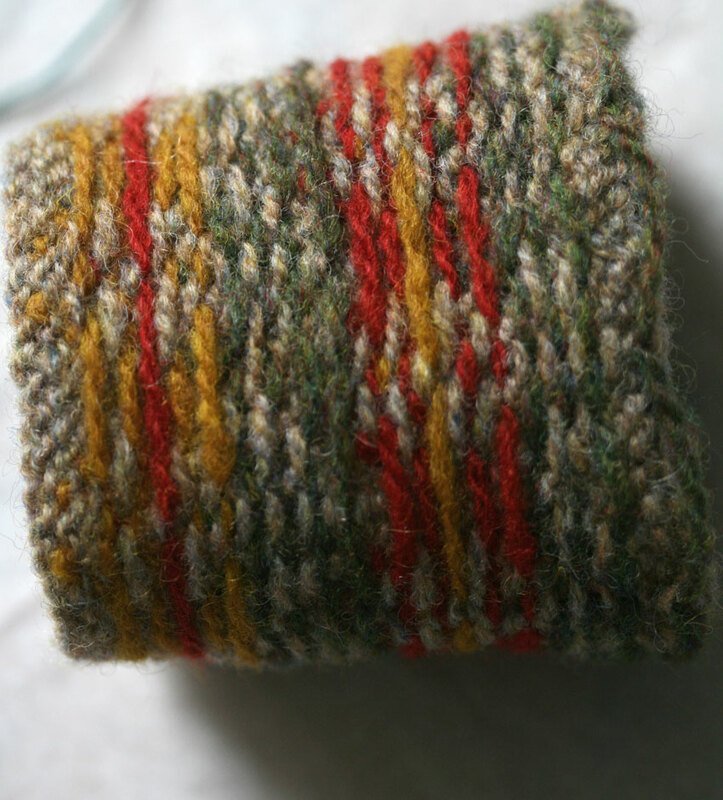 I’m currently knitting Tortoise & Hare so I am building up to using this method rather than machine sewing the steeks. This is excellent! 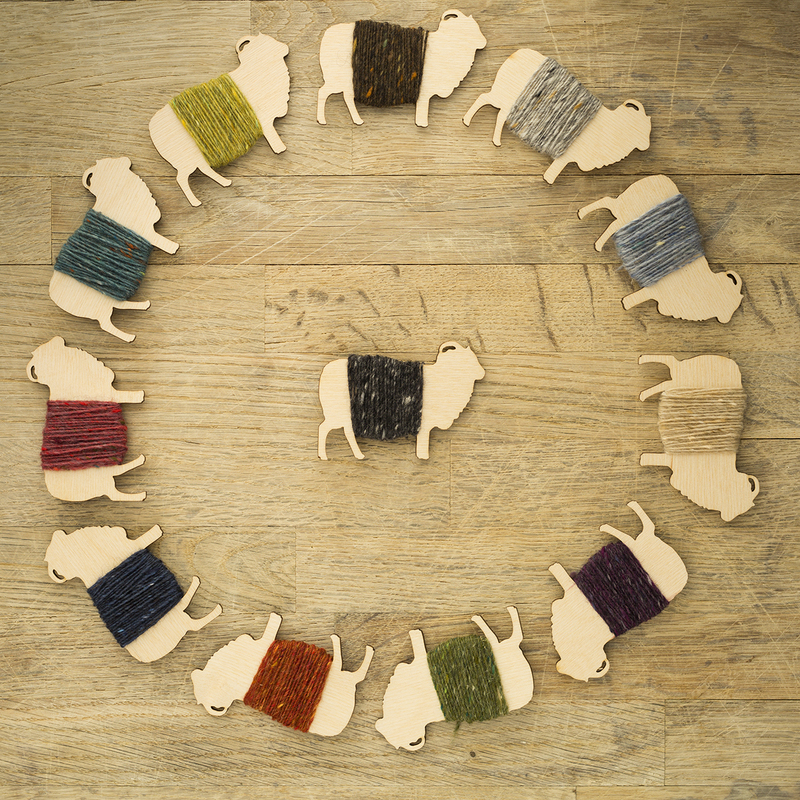 A group of us are making your “Rams and Yowes” blanket together at our LYS (Woolbearers in Mt. Holly, NJ), and this will come in very handy. thank you for this very clear explanation. I steeked ones before by knitting a row of purl stitches, machine stitching alongside both edges and cutting in between, but your method looks nicer. Unfortunately I just finished the body of a to be steeked cardigan with again a row of purl stitches. So I don’t think I can use your method on it…. I’m so enjoying this steek series – well written & photographed, thanks so much! Thank you for these clear instructions, you really make it look easy! Wow, thank you so much! It looks a lot less scary now. The explanations seem very clear; now I just need to try a swatch. Thank you so much for this excellent tutorial. 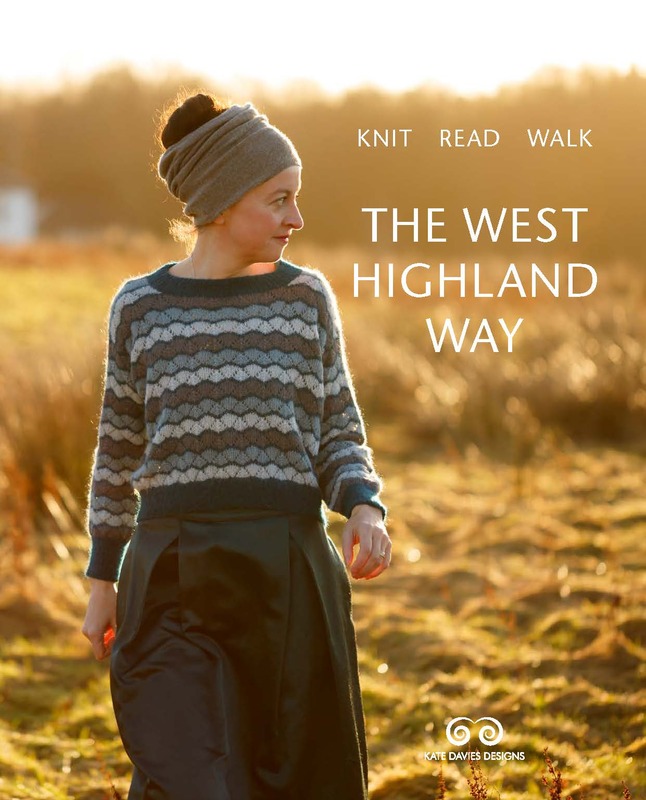 I look forward to the third part – and the cardigan pattern! Any suggestions for those who don’t know how to crochet? WOW !! thank you so much for this wonderful article ! Thank you for your posts on steeks. I have done a few but have not liked how the cut edges have been finished (with a sewing machine). I was intrigued by an earlier post that showed a crocheted edging; now I have the secret! Thanks. I’m casting on NOW, I cannot wait to see the magic squirrel that is the crochet chain for myself! Previous steeking also turned out neat for me, but was laborious with stitching down the turned in cut sides. However, I would also like to try the woven in strands technique that you showed on your vintage cardigan. That would be a lot of work, but it also looked extremely neat and non-bulky. Looking forward to reading part 3.
nice tutorial, thanks… i’ve always machine sewn steeks before, but will give this a try next time, that edge looks very tidy! Thank you so much for posting this. I’ve always wondered how to steek and now it doesn’t seem so scary. You just took the fear and mystery out of this for me. I’m now going to finish something I started for my daughter three years ago and just couldn’t make myself cut the steek. Here goes nothing! A welcome tutorial, Kate. So far, I’ve only worked broader steeks with even numbers of stitches (eight or ten) which, after cutting, become narrow facings along the garment’s opening. Then I work a broad cross-stitch over them (using the same sort of yarn as the rest of the garment) across their width and up and down their length, in order to tack them down and contain their loose ends. Needless to say, given the quality of my hand-stitching, they’ve always seemed a bit lumpy! 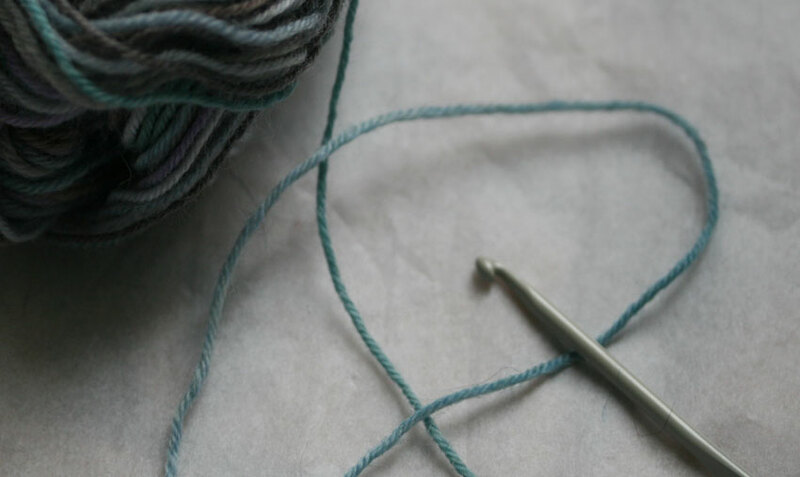 Your crochet-edged process promises to be much cleaner and more elegant. I’m going to work with it on some practice pieces to build skills for the next steeked project. Thank you very much. Clear instructions and perfects photographs. I am ready! Absolutely stunning craftsmanship! I have no intention of steeking anything in the near future, but I thoroughly enjoyed the beauty and skill employed in this. Thank you so much for your contribution to the world of knitters! Thank you for the detailed crochet instructions. 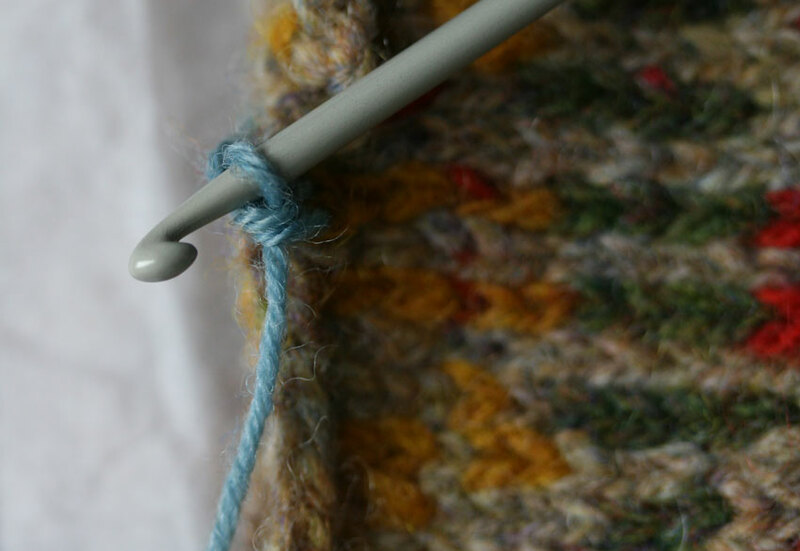 Showing the placement of the crochet rows pre- and post-cutting is very helpful. Thanks so much for these detailed tutorials Kate! 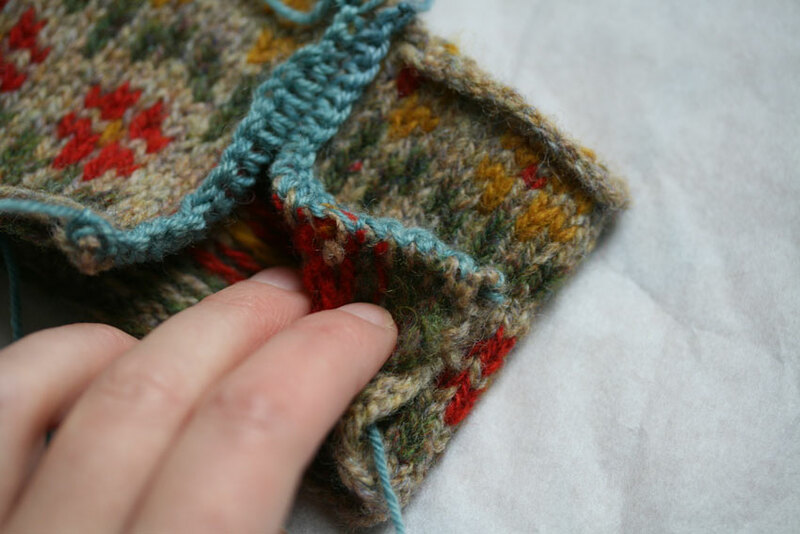 I have never steeled anything, but now I’m not sure why, since I love cardigans, but really hate unkempt-looking edges, and it seems like your method will lead to a nice neat edge without too much sewing. SOOO looking forward to the peerie floors cardigan pattern! thanks for sharing, I am so inspired to try this! This is wonderful! I no longer feel afraid. I will definitely try steeks now thanks to your encouraging instructions. Thank you for this! I can see I will need to practice this! Can I ask, would you normally do the crochet in a similar colour yarn to the rest of the garment, or doesn’t it matter? The thought of a ‘Peerie Flooers’ cardigan is very tantalizing! Wow! I’ve enjoyed this and your previous post so much, and I might even be strong enough to have a go. Your explanations and illustrations are so clear I feel only a total numpty could go wrong (that could be me then). I really would love to step up my knitting a notch or two (or five or six) and this could be it. Even if I don’t go for it, thank you so much for these excellent instructions – you share your wisdom so generously. BTW I loved the last photo in your previous post, completely unexpected and made me laugh out loud. 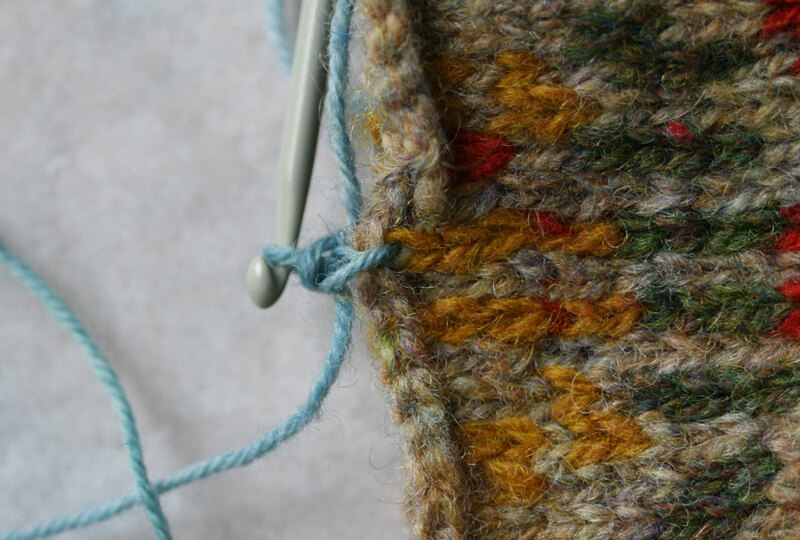 I love your method, which is very much like my own, but not purling the steek stitches, and having your ‘designated’ steek stitches knit in a steek pattern (stripe or checked as you say). It makes me think, in fact, one could steek any place then, and not have to even decide until the sweater is knit up, whether or not to make it into a cardigan (with opening left, right, or center), or remain pull over. I will try your method next steek !!! This is a wonderful set of instructions! I’m nervous about cutting into anything knit, but now I’m going to give it a try. The pictures are so helpful too.